Most work in algorithmic game theory assumes that players ignore costs incurred by their fellow players. 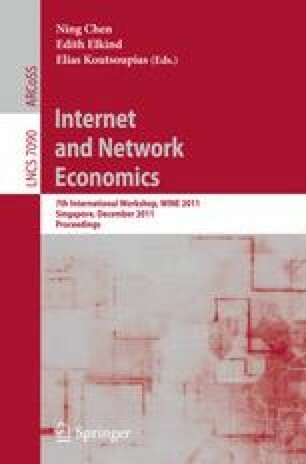 In this paper, we consider superimposing a social network over a game, where players are concerned with minimizing not only their own costs, but also the costs of their neighbors in the network. We aim to understand how properties of the underlying game are affected by this alteration to the standard model. The new social game has its own equilibria, and the price of civil society denotes the ratio of the social cost of the worst such equilibrium relative to the worst Nash equilibrium under standard selfish play. We initiate the study of the price of civil society in the context of a simple class of games. Counterintuitively, we show that when players become less selfish (optimizing over both themselves and their friends), the resulting outcomes may be worse than they would have been in the base game. We give tight bounds on this phenomenon in a simple class of load-balancing games, over arbitrary social networks, and present some extensions. This work was supported by NSF grant CCF-0728779 and was underwritten in part by grants in support of undergraduate research from Carleton, Denison, and Oberlin. Thanks to Dev Gupta, Jason Hartline, and Thanh Nguyen for helpful discussions.